Welcome to the Sunshine State, where students are constantly in the middle of bathing suit season, and that means they're constantly working to stay in shape. The brave run through campus and show off their athleticism, while some choose to get inspired while running the bleachers of The Swamp, Florida's legendary football stadium. For those who prefer to still manage to be lazy while working out by watching TV have plenty of on-campus gyms to choose from, but should remember that the gym here is almost always a social scene. Yes, this gym is located in the campus-version of the middle of nowhere, but it is well worth the trip. It’s the newest workout facility on campus and it’s by far the biggest. It has everything you could ask for – a two-story cardio room with personal TVs, an indoor track and a room dedicated to strength training. It also houses basketball courts, racquetball courts, massage therapy rooms, personal training studios and locker rooms. It’s best to go earlier in the day so that you can find parking and grab an elliptical before they all fill up. Essentially, Student Rec is just a smaller version of Southwest. During busy gym times (usually when people are trying to fulfill their New Year’s resolutions) it can get crazy crowded because it’s the most conveniently located workout hub. We’re talking one person in, one person out. “This is the best gym because it’s literally right in the middle of campus,” RA junior Ryan Coleman said. “I can go in between classes to save time.” Try out one of their many group classes like ballet strengthening or kickboxing to get yourself back in shape, but make sure you sign up online in advance. Ladies, beware. Located just up the street from fraternity row and dedicated entirely to weight training, this place is pretty much the frat boy mecca. In other words, don’t show up without your makeup done if you’re looking to avoid any awkward encounters. For guys (or girls who just don’t care) working out at the O’Connell Center is a pretty cool experience considering you’re pumping iron in the presence of history. 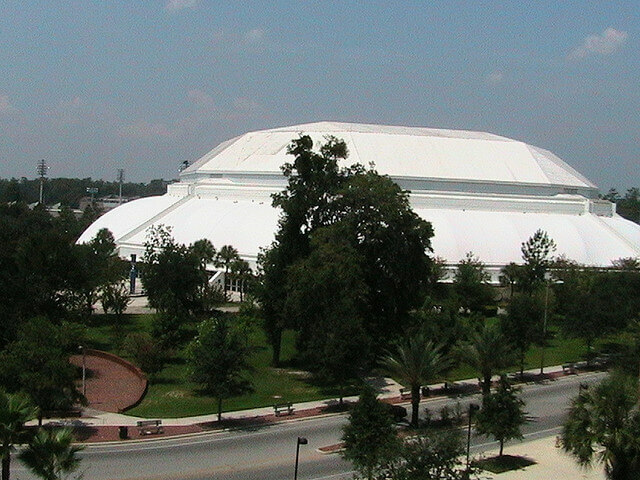 The O’Connell Center is home to Gator Basketball, Gymnastics, Swimming, Diving, Indoor Track and Volleyball, so the athletes and trophies accompanying you under the white dome provide a whole new level of motivation. The only downside is that it opens later than the rest of the gyms on campus.